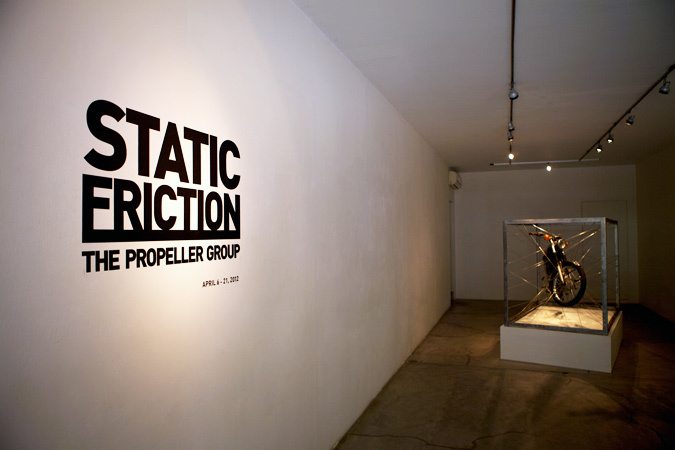 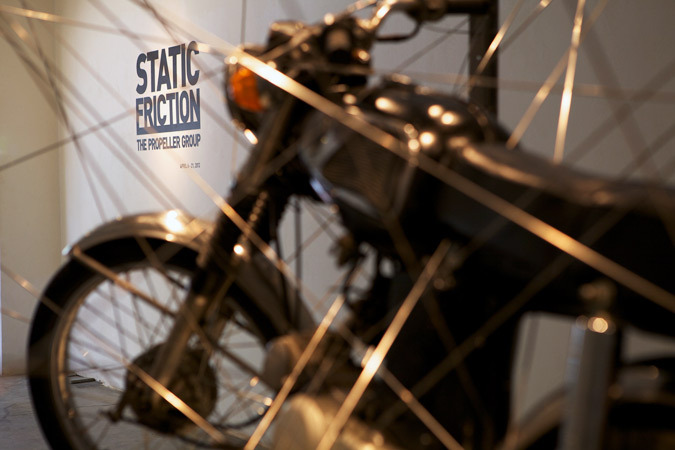 Static Friction takes as its point of departure the ubiquitous motorbike as it is experienced in Vietnam – as an icon of social and economic mobility; a vehicle for individual identity amid social collectivity; a machine for a lawless subculture obsessed with speed and violence; and as a classic symbol of an historical era. 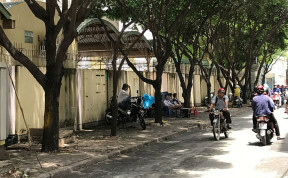 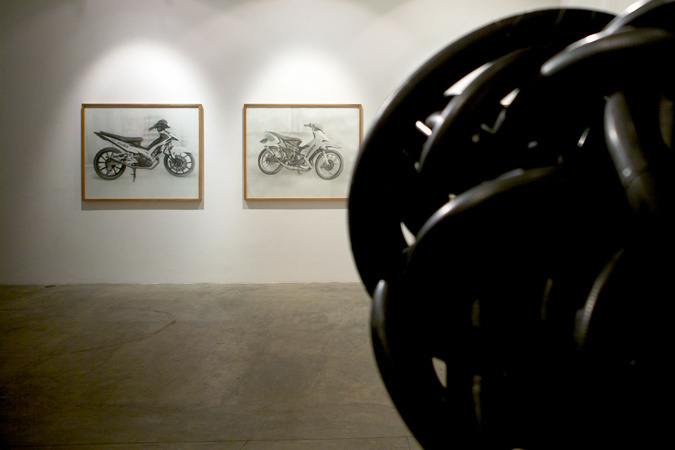 Though the exhibition is rooted in the context of Vietnam where over 85% of the population use motorbikes as their chief mode of transport, the central theme highlights broader issues related to globalism, identity, transgression, urban and economic growth. 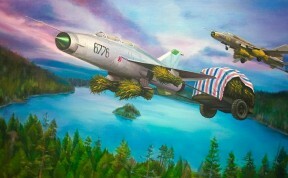 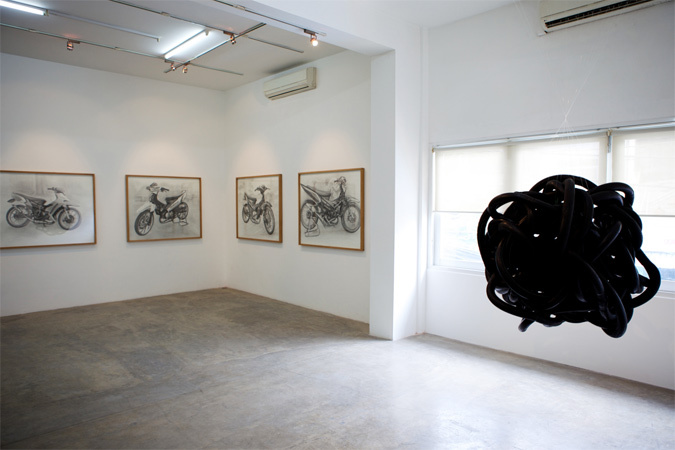 Honda classics such as the Dream and the ’67 are significant icons in the Vietnamese landscape, and in this exhibition both models are explored as cultural, historical, and aesthetic objects. 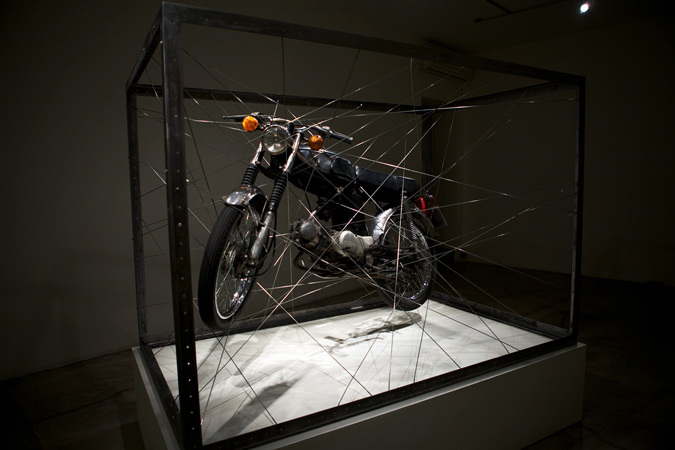 A Honda ‘67 is caught and caged in mid-wheelie position by a web of spokes, formally foregrounding action and mechanism. 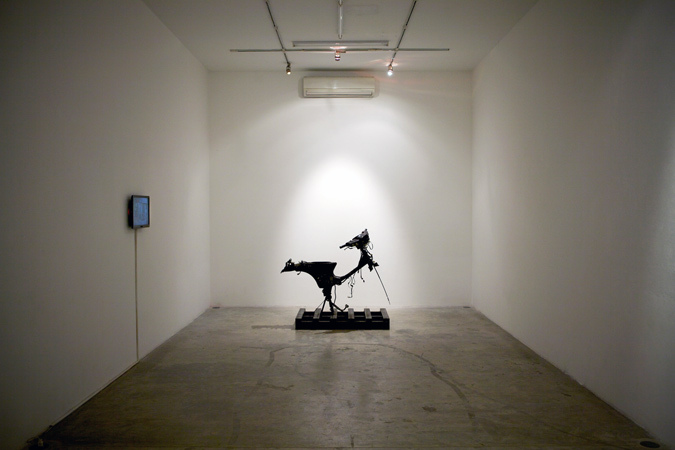 Inspired by the posture of the rearing steed in Jacques-Louis David’s portrait of Napoleon crossing the Alps, 1967: April 28 pointedly references a revolutionary date in history that is indelibly branded onto the collective, global conscience. 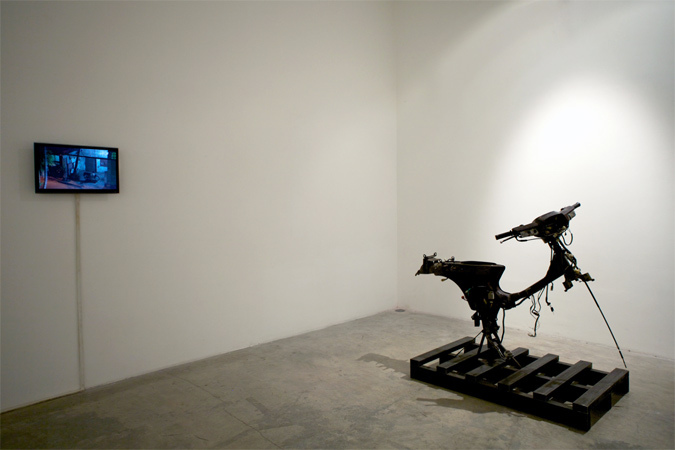 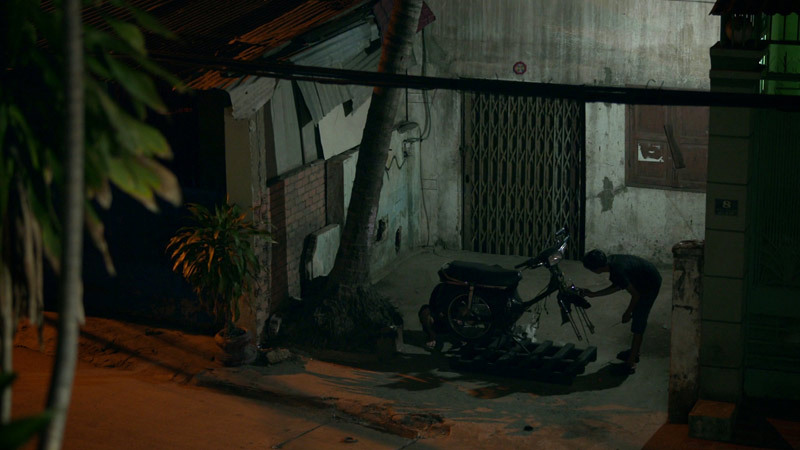 A video installation features a Honda Dream left as prey on a random Ho Chi Minh City street. 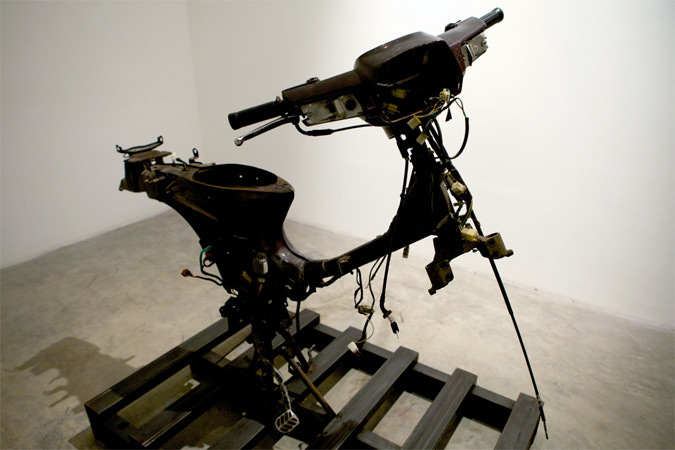 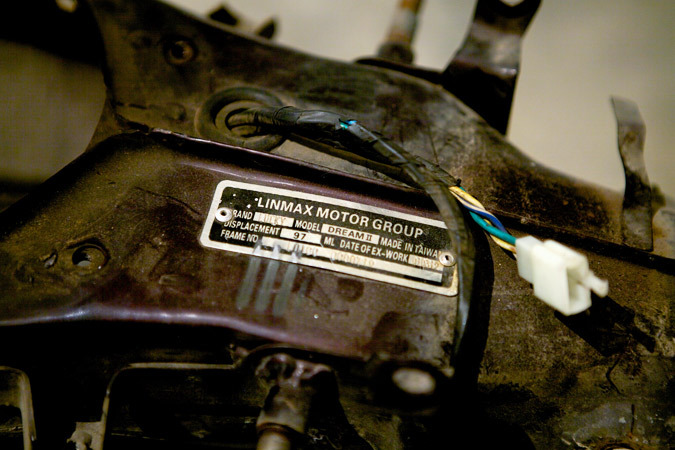 As the night moves forward, thieves move in to pillage the machine of all desirable parts. 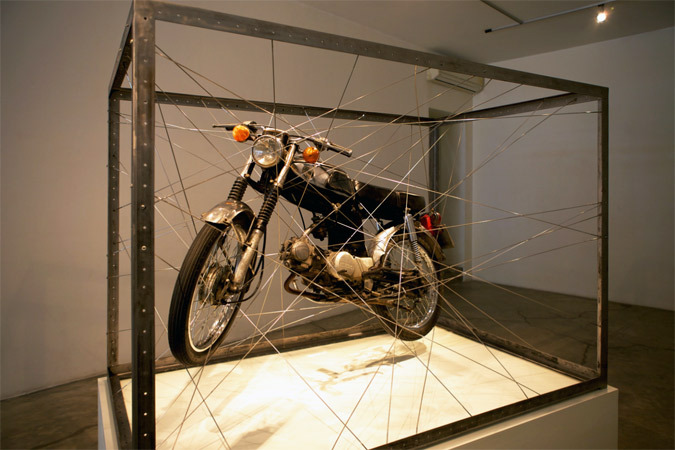 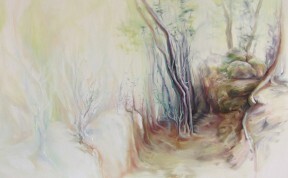 The new day yields a ‘fallen’ dream, stripped down and vulnerable yet still standing, a skeleton of its former self. 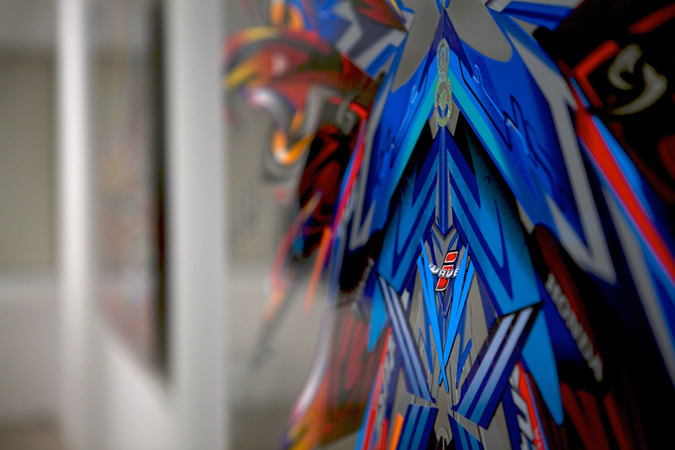 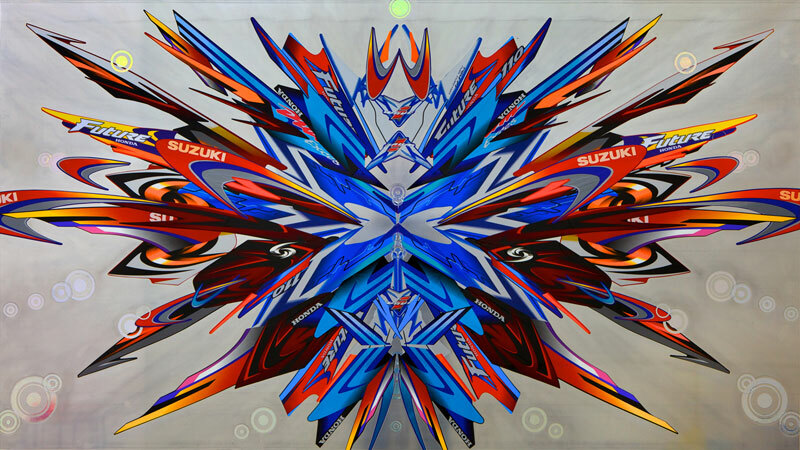 In Collision, vinyl stickers are used to create vibrant and surprising compositions that celebrate the rich aesthetics and complexities of motorbike culture. 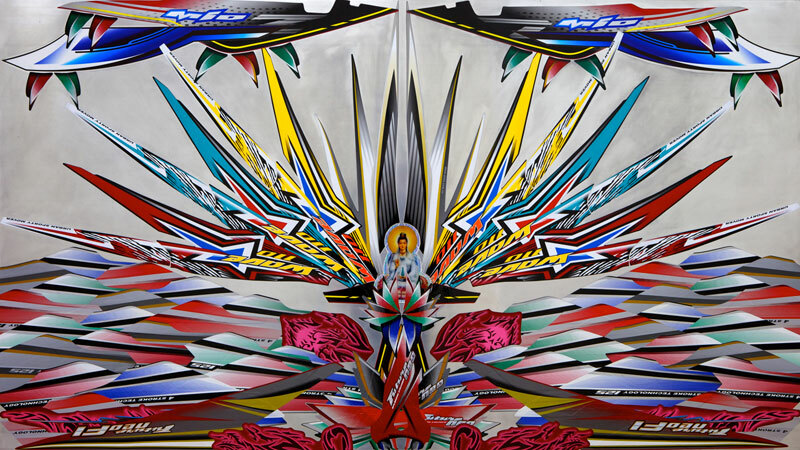 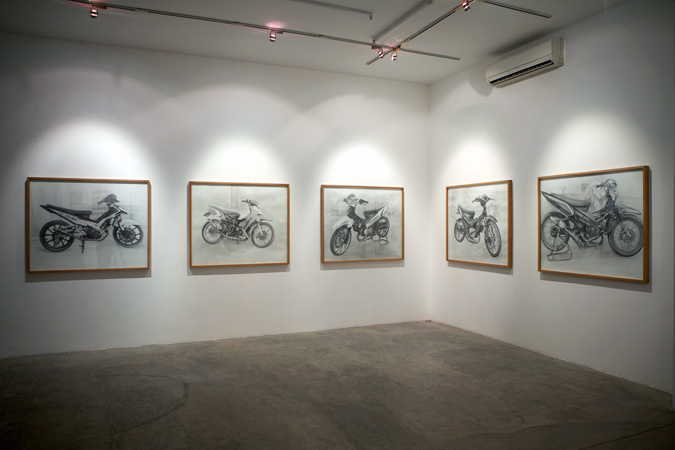 These colorful and glossy graphics are also the symbols of a rider’s sub-cultural and countercultural associations. 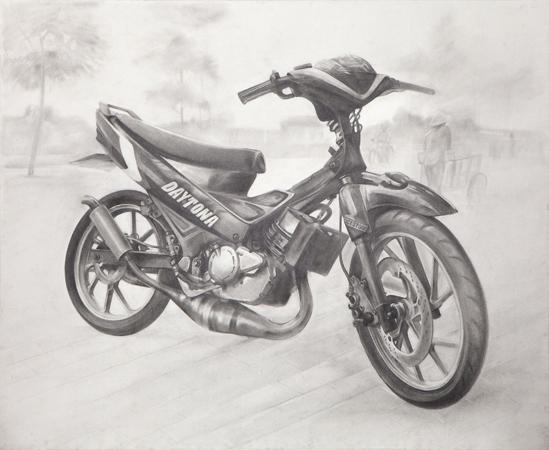 In contrast to the bold and seductive Collision pieces, the realistic black and white graphite drawings of racing motorbikes explore the connection between a rider and his bike, and the broader notion of identity. 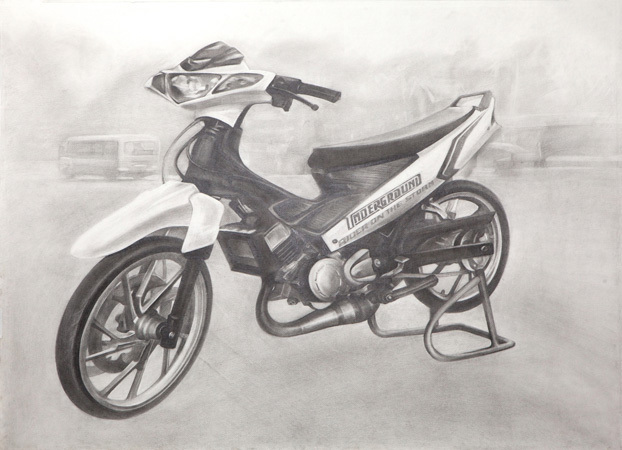 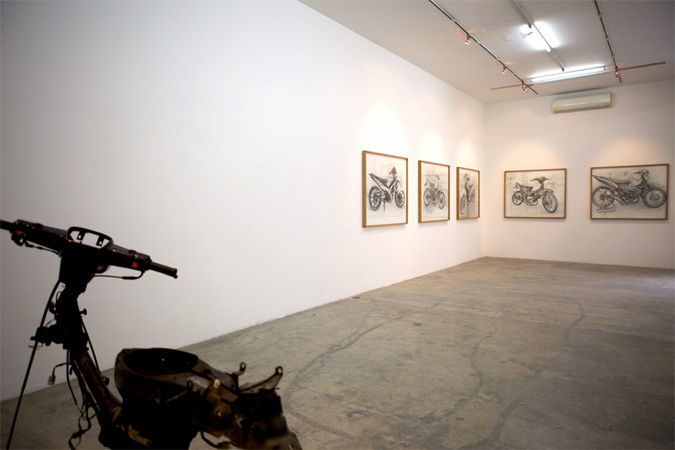 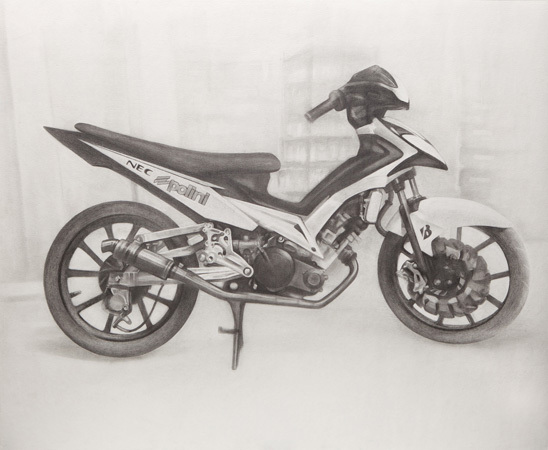 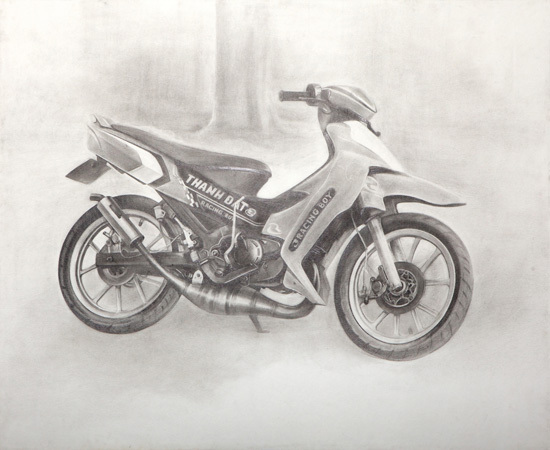 The subjects of these large-scale drawings are the bikes of well-known illegal street racers in and around Ho Chi Minh City. 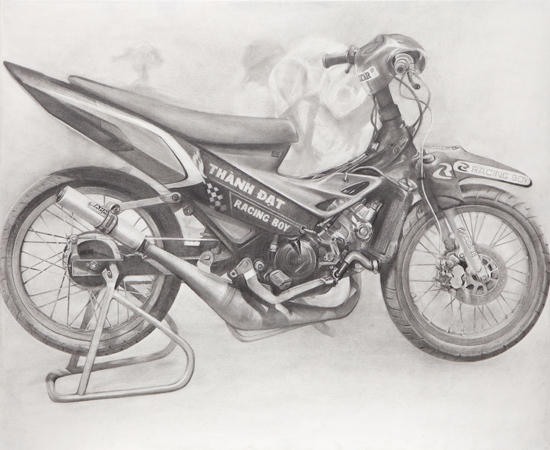 Serving as portraits of their owners, the souped up bikes also reveal the racers’ desire to assert their individuality amid the social collective. 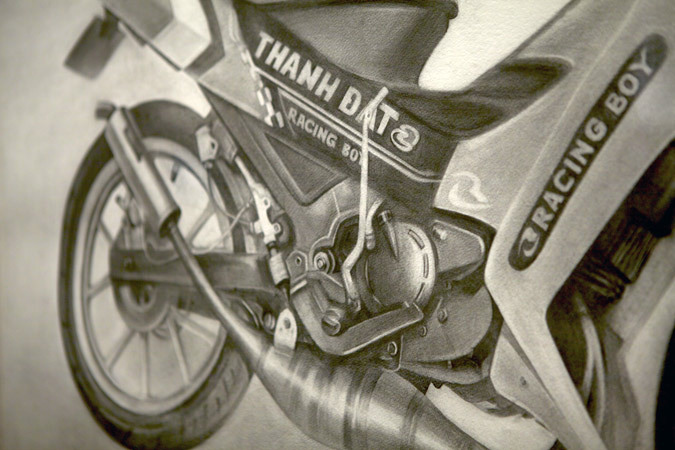 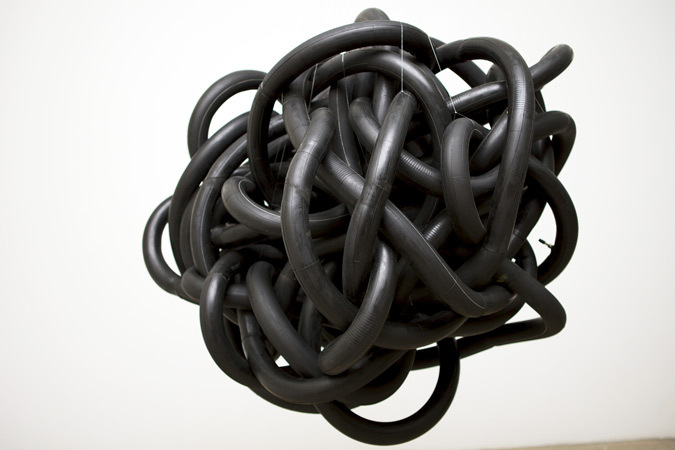 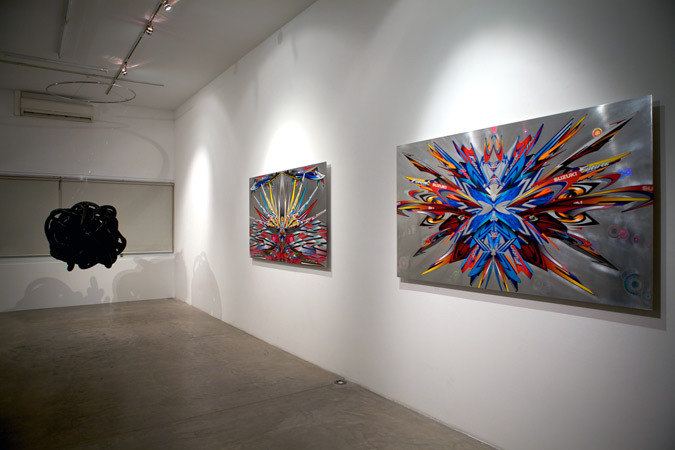 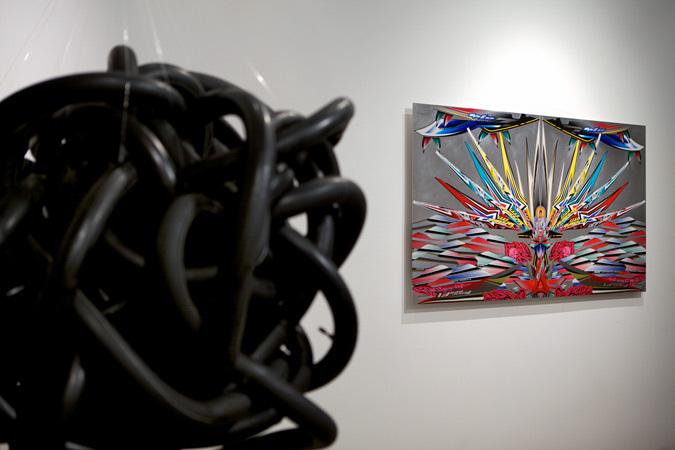 The works, based on images of the racing bikes sent by their owners via email, also touch on contentious issues surrounding reproduction, appropriation and authenticity.